← Friday 5th June 2015 – Flash!! Bang!!! Wallop!!! !…Then Sun? Today we were having a family trip up to the “Big City”. Mark works in London so goes up every day, but the kids and I don’t go up much. If we ever comment on something like the traffic or all the people, Mark calls us “Country Bumpkins”. We arrived in London just before lunch time and went for a gentle stroll round Regents Park. 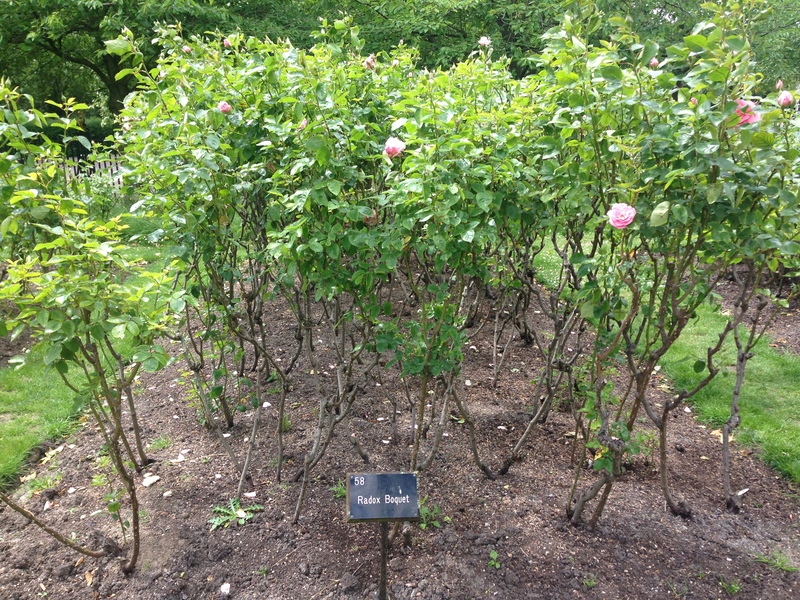 If you’ve not been, it’s very beautiful and the Rose Garden is gorgeous. I think my favourite name for one rose was “Radox Bouquet” and yes it did smell exactly like Radox bath salts!! Honestly, it really smelt like Radox bath salts!! There is a very serene large lake which had black swans on it and loads of ducks and geese swimming about. The male pigeons were getting a little frisky, but the females weren’t impressed. 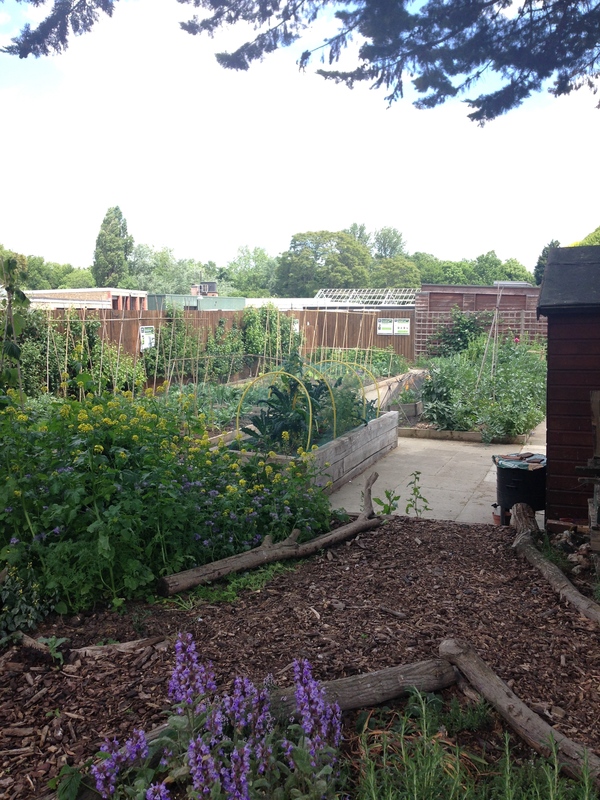 There is also an allotment garden, but was only opened on week days so I was unable to go in and have a nose round. Still you could view it from the road side. And it had one hell of a scary scarecrow standing and staring at you. It clearly was doing it’s job as there were no birds in sight. What a lovely looking vegetable patch. Perfect in every way. We then found a lovely place to have lunch in the park and we all had a huge cumberland sausage in a brioche roll with onions, it was very tasty. Once we’d eaten and drunk we then walked off to Madam Tussauds. Our entry time was 2pm-2.15pm and we couldn’t be late. Now Mark has been before, but when he was about 11 years old I think, but the kids and I have never been. To be honest, I wasn’t sure what to expect. 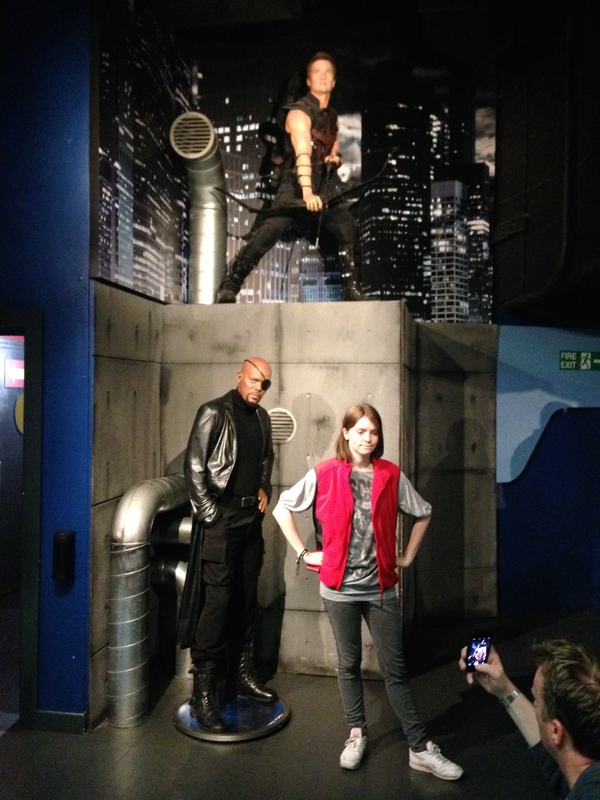 I thought it would be a dark room that would walk through and can only look at the wax works, but it’s not. You can go and stand by them and have your photo taken right next to them. Some are incredibly well done like Tom Cruise and they even have his tooth in the middle. He’s very short though!! Others like Tom Hanks were a bit…eh. Looked sort of like him about 20 years ago, but not a very good likeness. George had fun posing by loads of them, and Emily took loads of photos. We all went round sometimes separately and sometimes together. It was like walking down the red carpet with all these A list celebrities. 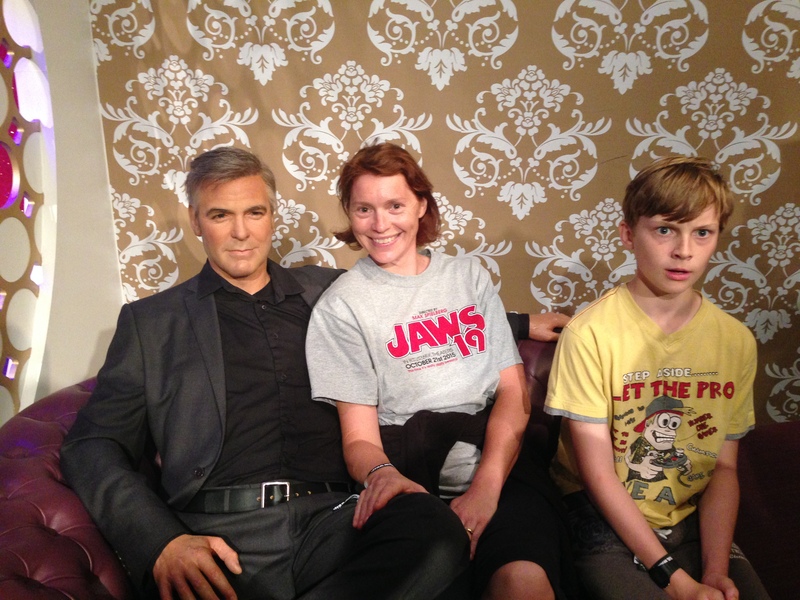 I had a quick sneak peak up Sean Connery’s kilt (didn’t see much) and sat on the sofa with George Clooney, even made of wax he’s….WOW!! A George either side of me. Aren’t I a lucky girl!! You went from room to room, and Emily was very excited when she saw Katniss Everdeen from The Hunger Games, and George nearly fainted when he saw Arnie as The Terminator. There were loads of sports personalities, most I knew, and others I had no idea who they were (mainly footballers). Mark had a script con-flab with Charles Dickens and William Shakespeare, and tried to work out what “n” was worth with Albert Einstein (it’s 10!). George chatted on President Obama’s phone in the Oval Office and we posed with Churchill. Oh, and I had my photo taken with the royal family. They were very obliging and friendly. 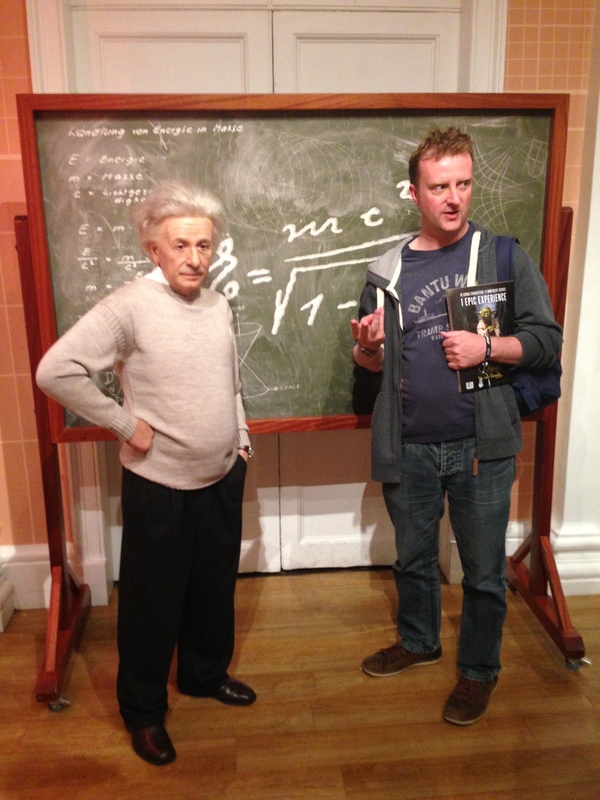 Don’t worry Albert, he’ll get the answer soon …I hope! It was then on to a little ride they called “The Spirit of London Ride”. This took you through the Queen Elizabeths the I’s reign, and included the plague and that part smelt horrible. This was a Claire friendly ride with a gentle turning of your cab from one side to the other. Then it was onto Emily’s favourite part “The Marvel Superhero” section. They posed with Hawk Eye, Nick Fury, Wolverine and so many others (I hope you’re impressed I know the characters names?). There was then a 4D film to watch. This again is Claire Friendly. The seats vibrate (which is always good), and you put on those 3D glasses so the screen comes out at you, and then obviously you get a bit wet. It’s just like being back in Florida again!! Then it was on to Mark’s Favourite bit and to be honest the only reason why we came. STAR WARS!!! He’s a massive fan of Star Wars (episodes 4, 5 and 6 of course. 1, 2 and 3 take them or leave them). Mark tried to calm down a light sabre fight, fly the Millennium Falcon, and stretch out to Darth Vader. 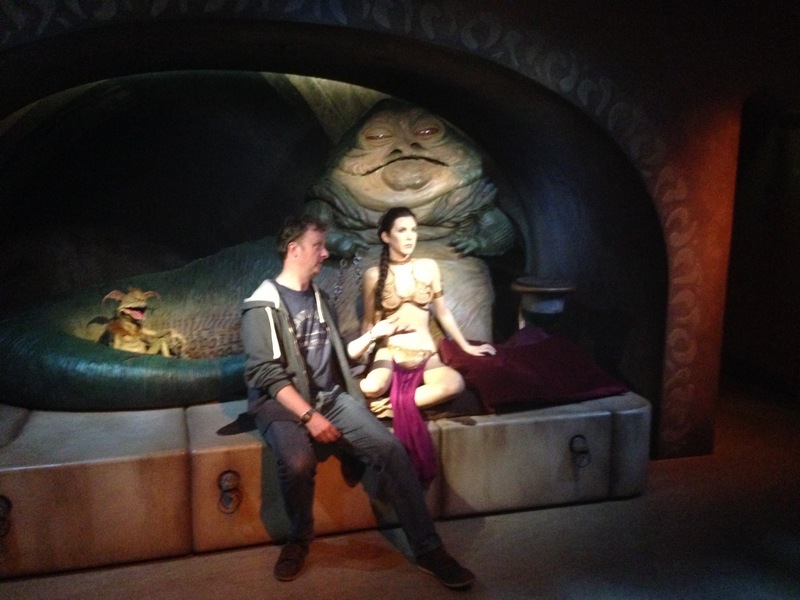 We also all sat with Jabba the Hutt and Princess Leia (in the gold bikini of course). I bet she gets a bit chilly. We then went back to Regents park to have an over priced ice cream and George got to play in the play ground for a bit, and then it was on to see where Sherlock Holmes lived (221B Baker Street for those of you who don’t know). It’s just a house, but is a magnet for tourists. 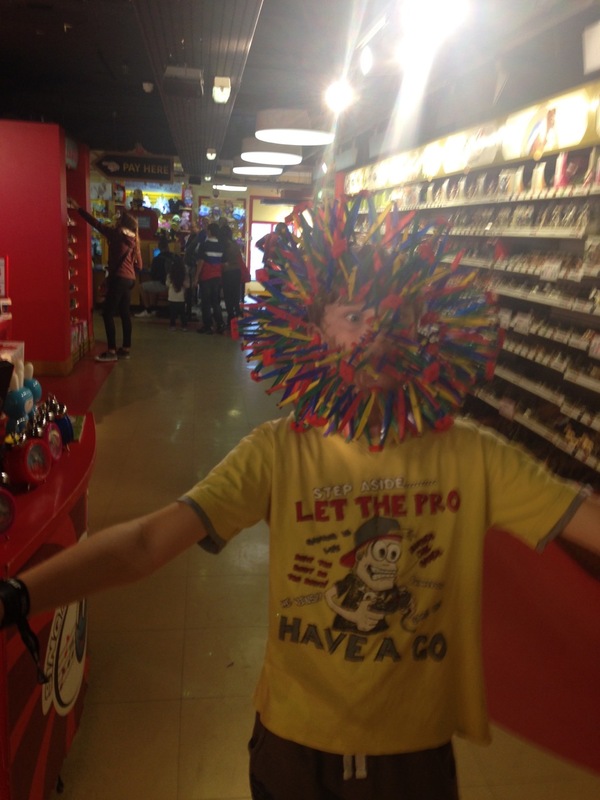 The kids then wanted to pop along to Hamleys. We started at the top and worked down, which is the best way of doing it. We didn’t use the lift to get to the top floor but instead walked all the way up to the 5th floor. It was much quicker than the lift any way and we got some exercise as well. None of us bought anything, but we all got to play with various toys. I tried out a remote control Minion. But I’m not very good with them, and crashed it into a ladies legs. It didn’t hurt, but I apologied and then gave it back to George. George met Her Majesty in Lego and bowed like a gentleman, I drove a fake tube train (they wouldn’t let me drive a real one!) And George then put something on his face. It’s best not to ask!! Then it was time to catch the train home and have fish and chips for dinner. A wonderful day full of new experiences. We were all very tired and all went to bed nice and early. This entry was posted in Uncategorized and tagged Albert Einstein, Arnold Schwarzenegger, Charles Dickens, claire's allotment, Darth Vader, George Clooney, Gold bikini, hamleys, Harrison Ford, Hawk Eye, Jabba the Hutt, Katniss Everdeen, Madame Tussauds, Marvel, Millennium Falcon, Minion, Nick Fury, Oval Office, President Obama, Princess Leia, Queen Elizabeth I, Radox Bouquet, Regent's Park, rose, Sean Connery, Sherlock Holmes, star wars, The Hunger Games, The Spirit Of London Ride, The Terminator, Tom Cruise, Tom Hanks, William Shakespeare, Winston Churchill, Wolverine. Bookmark the permalink.